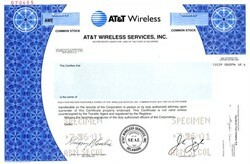 Beautifully engraved specimen certificate from AT&T Wireless Services, Inc printed in 2001. This historic document was printed by the American Banknote Company and has an ornate border around it with a vignette of the company's logo. This item has the printed signatures of the Company’s Chairman and CEO, John D. Zeglis and Senior Vice President, General Counsel, and Secretary, and is over 15 years old. AT&T Wireless Services, Inc., founded in 1987 as McCaw Cellular Communications, Inc., and now legally known as New Cingular Wireless Services, Inc., formerly part of AT&T Corp., is a wireless telephone carrier in the United States, based in Redmond, Washington, and later traded on the New York Stock Exchange under the stock symbol "AWE", as a separate entity from its former parent.